People hold a funeral for a person who died when a gas pipeline exploded in the village of Tlahuelilpan, Mexico, Jan. 20, 2019. The death toll from a fuel pipeline explosion in central Mexico last week rose to 91 Monday as Petroleos Mexicanos (Pemex) defended its response to one of the deadliest incidents to hit the state-run oil company in years. 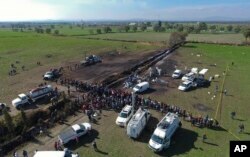 Hundreds of people near the small town of Tlahuelilpan in Hidalgo state rushed to collect gasoline from a gushing pipeline that authorities said was punctured by suspected thieves, and dozens were caught in the explosion that followed. Some people at the blast site said those shortages had encouraged local residents to try to make up the deficit by collecting fuel from the ruptured pipeline — a version of events that was backed up by officials in the state government. People react at the scene where a ruptured fuel pipeline exploded, in the municipality of Tlahuelilpan, Hidalgo, Mexico, near the Tula refinery of state oil firm Petroleos Mexicanos (Pemex), Jan. 18, 2019. Pemex Chief Executive Octavio Romero said his team followed protocol, though he would not confirm or deny whether there was negligence or corruption related to the delay in closing the pipeline. “Everything will be looked at,” he said.